This is the second post of the day. 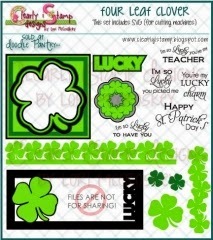 I wanted to show the versatility of these wonderful digital sets and svg sets that you can get at Doodle Pantry. 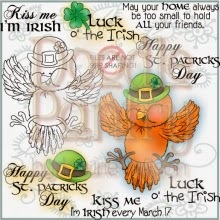 Using the same two sets Irish Birdie and Four Leaf Clover SVG sets, I created this card. All of the cuts for the four leaf clover are actually the insides of the frame that was used in the first card. I took the smallest inset in my Silhouette and did an internal offset. That is how I got the last piece, which is the white leaf with the image on it. I brought the pre-colored image from Irish Birdie into my Silhouette and put it inside the leaf and did a print and cut. There is a set of loose four leaf clovers in the set and I cut 4 large and 8 small clovers using the darker green card stock. I put 3 in each corner and then added 2 different sizes of green crystals. The clover was layered onto white card stock and then onto a black card stock base. So, just using the remnants of the first card, I was able to very quickly make another card. How fabulous is that? Here is what you get in the sets. Thanks for joining the Scribble and Scrap challenge. Lovely clean and bright card. Again simply fabulous. Great cas card and loving the bit of bling. Such a pretty card. Love all the layers. Thank you for sharing your wonderful card with us at Stamping Sensation.